The famous passage known as the pericope adulterae, about which there is a long bibliography and on which Chris Keith has written perhaps most recently (e.g. this survey paper and this book), is not a regular part of the Bible in Syriac. 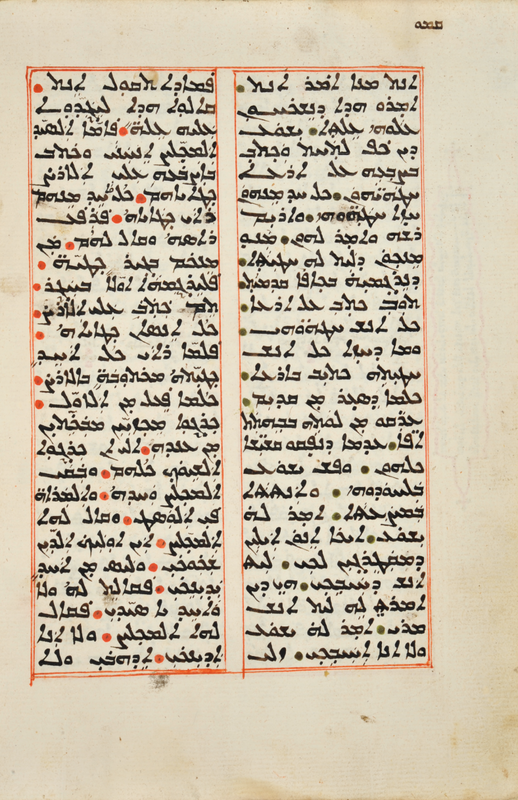 That is, it is not in the typical text of the Peshitta, nor in the Old Syriac, nor even the Harqlean, but we have traces of it, on which see Gwynn, Remnants of the Later Syriac Versions of the Bible (1909), lxxi-lxxii, texts on 41-49, and notes on 140. 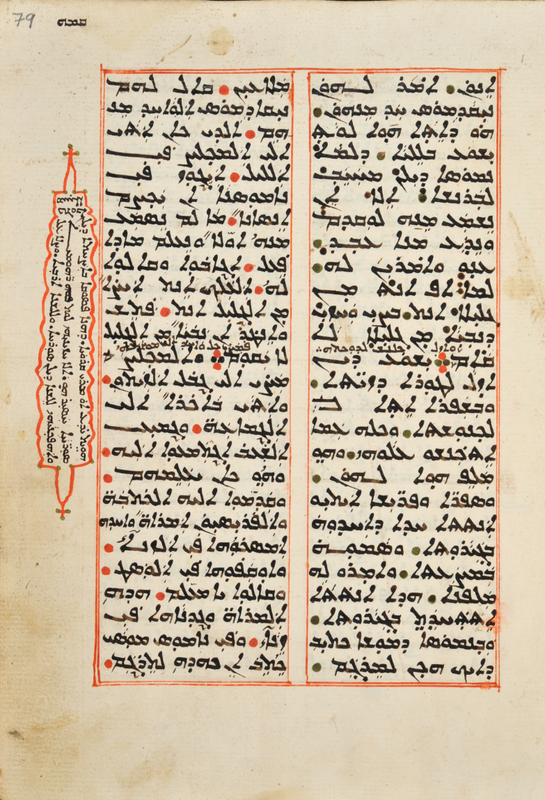 Gwynn (lxxii) refers to a late Syriac copy, which he does not print, “judging from internal evidence that it was merely a translation from the Latin Vulgate probably connected with the action of the Synod of Diamper,” but he does give some Syriac texts of the passage. The situation with biblical texts in Arabic versions generally being more complicated than Syriac, we can’t say much without further work, but in my recent cataloging work I have come across a copy of the passage in both languages in a late seventeenth-century lectionary (CCM 64) with Syriac and Garšūnī in parallel columns. According to this manuscript’s long colophon on ff. 202r-205r, the book was finished on 7 Ḥzirān (June), a Friday, 1695 AD and 2006 AG, written in the village of ʕayn Tannūr by a scribe named ʕabdā l-ḥad, whose name is given explicitly and also cryptically and acrostically in the series of words ʕabdā bṣirā dawyā allilā lellā ḥbannānā d-šiṭ min kolhon bnaynāšā (“unworthy slave, weak, insignificant, foolish, slothful, more wretched than anyone”). Know, dear reader, that this pericope [pāsoqā] is lacking in our Syriac copy [lit. the copy of us Syriac people], but we have seen it among the Latins [r(h)omāyē], and we have translated it into our Syriac language and into Arabic. Pray for the poor scribe! John 7:53, in both languages is written interlinearly, but 8:1-8:11 appear just like the rest of the text. (The word pāsoqā above can mean “verse” as well as “section, pericope”; given the history of this passage, in Syriac and other languages, I have taken the word to have the latter meaning here, and not to be merely a reference to the interlinear verse.) Were it not for the marginal note, the reader would have no idea that the passage does not normally occur in the text. Here, then, is a little something for other Syriac and Arabic/Garšūnī readers; I have not compared this Syriac version carefully with those given by Gwynn, but for anyone who wishes to do so, here it is. Happy reading! As always, very interesting. I only wonder if r(h)omaye here could mean ‘Greek’. Why do you think it stands for ‘Latin’? Thank you, Grigory. It’s a good question, and “Greek” is possible. Latin, however, may be likely because of the definite and widely accepted position of this pericope in the Vulgate and the probable closer connection to Latin Christianity of a Chaldean scribe. Also, my feeling is that for Greek in a textual or linguistic sense yawnāyā may be more usual. If you have any other thoughts about it, I would be glad to hear them! I think you are right and the connection to Latin tradition is crucial in this respect. It is however would be interesting to check how the Latins were called in the Chaldean milieu (I recall seeing the same usage somewhere in the works of Joseph II). A possible option could be also ܦܪܢܓܝܐ. Fascinating! Thanks! I’ll be blogging this on The Jesus Blog (www.jesusweblog.com).